Source: Pew Research Center’s Internet & American Life Project January 20-February 19, 2012 tracking survey. Thinking of posting a status update to let all your Facebook friends to know where you stand on the latest controversy over tax policy or immigration? Conventional wisdom: For the love of God, don’t! New thinking: Hey, that’s not a bad idea—especially if you’re a Democrat. That, at any rate, is one possible takeaway from a new survey by the Pew Internet & American Life Project. The survey of 2,253 U.S. adults found that nearly half of Democrats who use social networking sites say those sites are important to them in keeping up with political news. 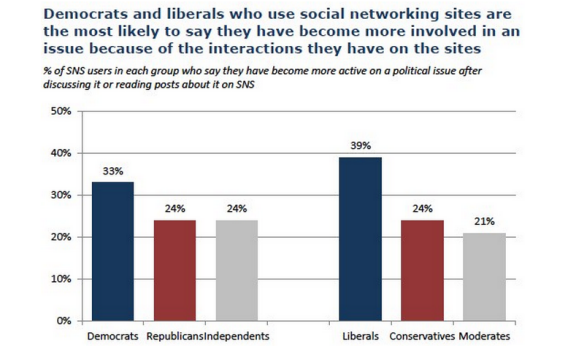 About one in three Republican social-network users say the same. Take that, cynical Facebook-meme purveyors. One irony: While liberals are far more likely to be influenced by political posts, it’s the “very conservative” who are most likely to report that virtually everything they post is political. Apparently everyone just tunes them out.